Aerial surveillancs showing two Khmer Rough gunboats during the initial seiziing of the SS Mayaguez. When a violent Khmer Rouge regime under the leadership of Pol Pot overthrew the Khmer Republic government, backed by the US, Cambodia was in the state of emergency. 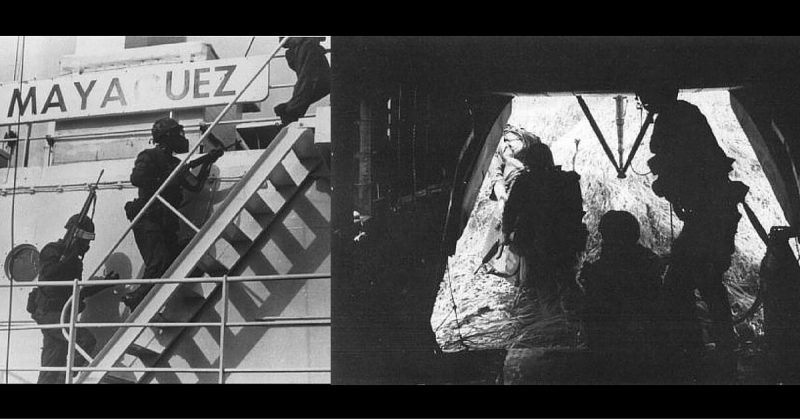 One month after the Khmer Rouge seized power, an incident occurred involving an American merchant ship, SS Mayaguez. 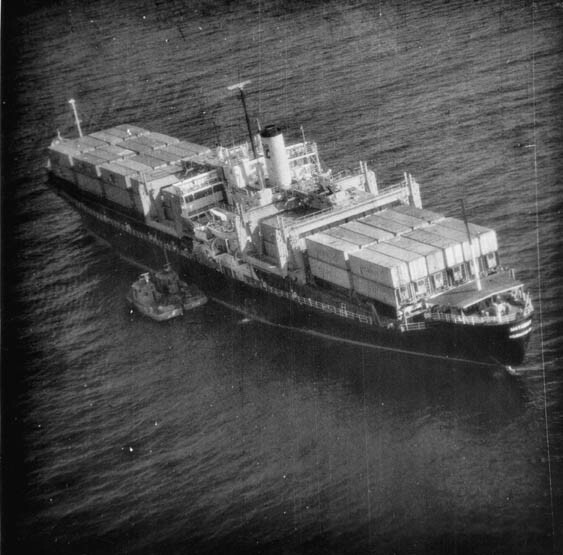 The SS Mayaguez was a container ship, working for the US military. The Mayaguez was carrying 107 containers of routine cargo, 77 containers of government and military cargo, and 90 empty containers, all insured for $5 million. The Khmer Rouge never inspected the containers, and the exact contents had not been disclosed, but the Mayaguez had loaded containers from the U.S. Embassy in Saigon nine days before the fall of Saigon. The captain had a U.S. government envelope only to be opened in special circumstances, which he destroyed. On May 12, 1975, the ship was en route to Thailand, sailing within the 12 nautical miles of the coast of Cambodia. The newly declared regime claimed that they were in the Cambodian territorial waters, even though the US recognized only three nautical miles off the coast of Cambodia as water under Khmer Rouge sovereignty. The Khmer Rouge stormed the ship with Swift Boats. They fired several machine gun rounds and a rocket-propelled grenade which were considered as warning shots. Captain Miller, who was in charge on the Mayaguez sent an SOS and halted the ship. The Khmer Rouge boarded and forced the captain to change his course and anchor at the Poulo Wai island, under Cambodian control. The Cambodians insisted that the captain should proceed to Ream on the Cambodian mainland, but due to a radar malfunction on the ship, they were forced to stay at Poulo Wai. Meanwhile, the Americans were outraged, and President Ford’s administration was already preparing a rescue mission. The wounds from the Vietnam War were still raw, and the public demanded a swift reaction. Aerial surveillance showing two Khmer Rough gunboats during the initial seizing of the SS Mayaguez. On the early morning of May 13, the ship was located at the Poulo Wai island by P-3 Orion aircraft which were designated to find the missing vessel. Two F-4 Phantoms fired warning shots near the ship, adding tension to the already turbulent situation. General John J. Burns, who was the head of the rescue mission, assembled a task force of elements of the III Marine Amphibious Force stationed in the Philipines and the 3rd Marine Division from Okinawa. They were joined by nine MH-53 “Jolly Green” helicopters. While the US Army was drafting rescue plans and pitching them to President Ford, awaiting approval, the Khmer Rouge evacuated the crew of the Mayaguez via fishing boats and headed for Kampong Som. This proved to be a bad idea, because, at that time, the US Air Force had established complete control over the area, with orders to shoot any approaching Cambodian vessels. After the US aircraft sunk one of the Khmer Rouge Swift Boats, they reported back, saying that a fishing boat was carrying approximately 40 Caucasians. It was immediately determined that the Caucasians were, in fact, the Mayaguez crew. The fishing boat proceeded to Kampong Som, carrying the hostages, but upon their arrival, a Cambodian officer in Kampong Som refused to receive them out of fear of American retribution. The crew, guarded by a handful of Khmer Rouge soldiers under the leadership of Sa Mean continued to the isle of Koh Rong Sanloem. The US was convinced that the prisoners must have been taken to Koh Tang, a large island off the coast of Cambodia. They planned to launch their main rescue assault there. General Burns wanted to simultaneously seize the ship and the prisoners. On the morning of 15 May, the ship was stormed by a group of marines, after its bombardment with tear gas. It was finally concluded that the ship was empty and that none of the crew were left aboard. Meanwhile, the landing on Koh Tang commenced. Due to lack of intelligence data, the numbers of Khmer Rouge on the island were severely underestimated, which resulted in carnage. There were two designated drop zones on the island ― DLZ East and DLZ West. Resistance was fierce at both of them. The US Army expected a personnel of 20-30 Khmer Rouge soldiers, poorly equipped and poorly motivated to confront the Marines. Instead, their welcoming committee was more than a 100-strong, and the battalion was equipped with AA guns and RPGs. The reason why the island was so heavily armed wasn’t because of the threat of US troops, but because of the Vietnamese, who were threatening to invade Cambodia and reclaim the Island of Koh Tang. Nevertheless, the entrenched Khmer Rouge responded with fire on the troop-carrying helicopters. The result was grim: of the eight helicopters assaulting Koh Tang, three had been destroyed and four others damaged too severely to continue operations. Thirteen men lost their lives before they even landed. Pockets of resistance formed around the two DLZs with 109 Marines joining the fight. They were denied reinforcements but had limited air support. The battle raged on throughout the day, until the Khmer Rouge information and propaganda minister, Hu Nim, made a radio broadcast announcing that the Mayaguez and its crew would be released. He insisted that the incident had gone too far and that the initial intention was only the defense of the territorial waters of Cambodia. The prisoners were soon handed over to the crew of the SS Henry B. Wilson, stationed off the coast of the Koh Tang island. After the prisoners were released, the commander ordered the U.S. forces to “immediately cease all offensive operations against the Khmer Republic [and to] disengage and withdraw all forces from operating areas as soon as possible”. Even though the release of prisoners was announced, the hostilities continued. Another 100 Marines reinforced the strike force on the island as they defended themselves from the Khmer Rouge. Aided by the firepower of the SS Henry B. Wilson which bombarded the island, the Marines were finally able to withdraw from Koh Tang. These 23 U.S. airmen were killed when their helicopter crashed due to a mechanical failure. In the aftermath, the 15 men who died in action on Koh Tang and three more were declared MIA. The Marines who went missing in action were captured and executed by the Khmer Rouge soon after the battle. 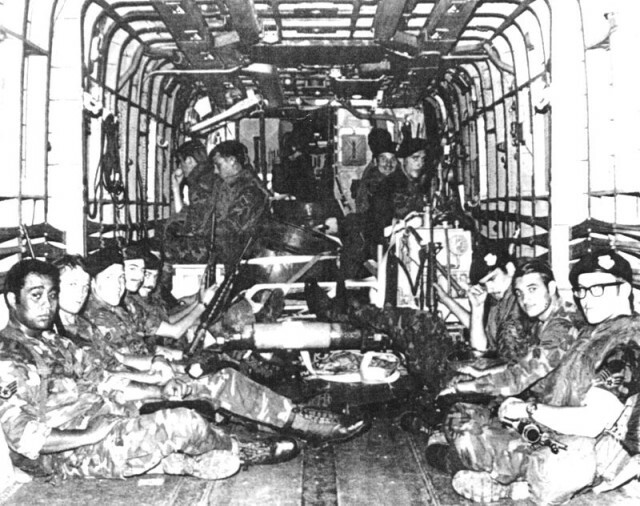 On return a CH-53 helicopter crashed due to mechanical failure on the way to U-Tapao Airfield, killing eighteen USAF Security Police and five flight crew. In addition, 50 men were wounded during the operation. This event is considered to be the last official battle of the Vietnam War. The names of the Americans killed, as well as those of 3 U.S. Marines who were left behind on the island of Koh Tang after the battle and were subsequently executed by the Khmer Rouge, are the last names on the Vietnam Veteran’s Memorial.